The style is cropped and very flattering. Lovely crispy Cotton shirt from Hollister - size S - long sleeves with button cuffs & button down collar. Hollister Small Blue And White Striped Shirt. Tiny check. Pattern: Striped. Type: Shirt. Label Size: Size 16 Large. Material: Cotton. NEW Hollister black blouse with metallic pin stripes in 10-12, REDUCED TO £8.00! BRAND NEW Hollister black blouse with metallic pin stripes, flared sleeve in size 10-12 with tags. Retail price £29.00 selling for £8.00!! 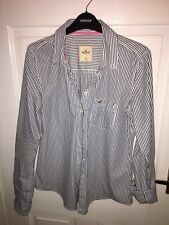 Ladies Hollister White & Grey Stripe Shirt - Size XS. Brand new been worn twice, no faults or defects. Been in a smoke and pet free home. Size M by Holister. Long Sleeve. Used but in Excellent Condition. 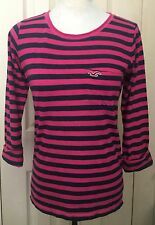 Hollister Womens Striped Fitted Shirt Medium. Condition is Used. Dispatched with Royal Mail 1st Class. Pattern Striped. Color is blue & white. Made of 100% cotton. Very Pretty Top! Size Type Regular. Style Knit Top. Color Blue. Pre-owned but in good condition. Hollister blue and white striped shirt with pink logo. Size small (chest: 21" 53cms). Add to Favourites. Do you have a size guide?. Color is navy blue (almost looks black). Made of 60% cotton, 40% polyester. Very Pretty Top! Size Type Regular. Style Knit Top. Color Blue. Sleeve Style Short Sleeve. Other Info. Left chest pocket with stitched logo. Neck to hem 26". Button down collar. Pit to pit 17". Size Small UK8/10. NEW Hollister Soft Cotton LS Shirt in ‘Grey’ (M) – RRP £29. Hollister Soft Cotton LS Shirt in ‘Grey’ (M). Overview: Hollister Soft Cotton LS Shirt in ‘Grey’. 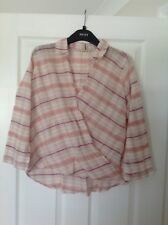 Can be worn on its own, loose, with t-shirt underneath, or jumper over the top, perfect for layering. Pattern Striped. Color is blue & white. Made of 100% cotton. Very Pretty Top! Size Type Regular. Style Knit Top. Color Blue. Sleeve Style Short Sleeve. Style: blouse. INT EU Short Long UK US. INT EU DE UK F IT US US. S 46 23 90 36R S. L 40 40 12 42 44 10 M. XL 54 27 106 44R L. 3XL 46 46 18 48 50 16 XL. 3XL 58 29 114 48R XL. Very Pretty! Pattern Striped. Style Button Down Shirt. Length: 27". Size Type Regular. Sleeve Style Long Sleeve. Material 100% Cotton. Other Info. Very Cute! Pattern Striped. 100% cotton, Supersoft, seagull embroidery at upper left. Style Button Down Shirt. Length: 22". Pre-owned but in good condition. Size Type Regular. Color Blue.